The Pullpots are off on a road trip and Baba Jee is driving! Join them as they admire the scenery and enjoy a picnic lunch. 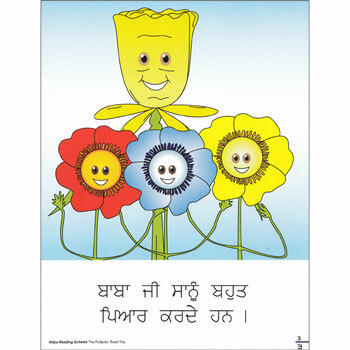 The Vidya Reading Scheme is a children’s levelled book series for Panjabi readers. 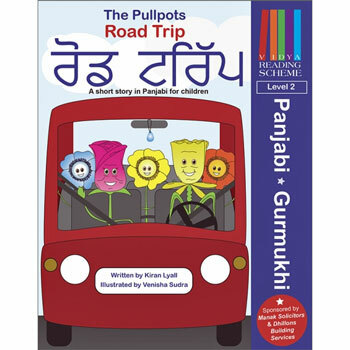 Written in Gurmukhi script, The Pullpots: Road Trip is the second book in the series (level 2), introducing children to a range of everyday words and sentences. These brightly designed and delightful short stories invite readers to explore the world of Gurmukhi Panjabi, creating confident readers along the way. The English transliteration at the back of the book allows non-Panjabi readers to join in. These books are perfect for the classroom and at home. Knowledge of the Panjabi alphabet, including vowels, is essential. 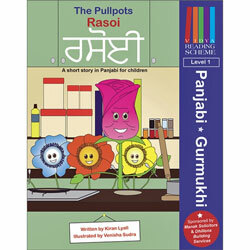 The Pullpots reading scheme is aimed at 6 -12 year old that are starting to read in Panjabi.